Our product range includes a wide range of mobile concrete batching plant rm- 800 and mobile concrete batching plant rm-1050. Owing to the hard work and true diligence of our efficient team, we are able to manufacture and export Mobile Concrete Batching Plant RM- 800 .These products are equipped to handle the mixing of large quantities that is required fro the construction of varied buildings. Owing to their reversible movement, these products are able to mix the contents and thoroughly. Our clients appreciate these products for their longer service and potable nature. 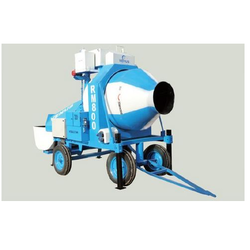 To fulfill the industry needs, we are offering our patrons a wide assembly of Mobile Concrete Batching Plant RM-1050. 4 Nos. of Lifting Hooks are provided to Lift the Machine for the Purpose of Loading and Unloading. Forward Rotation of the Mixer Mix and Reverse Rotation of the Mixing Drum Discharge the Concrete. Handle Provision is given at the Shaft end of Main Motor to Discharge the Concrete From the Drum Case of the Power Failure.